Congratulations to all you beautiful brides to be who are starting the New Year with the most wonderful present of all! As you embark on this stage in your life, it may seem the same things you experienced just a few months ago suddenly seem new again. The sky looks a little bluer, the flowers smell a little sweeter, I become a little cheesier. 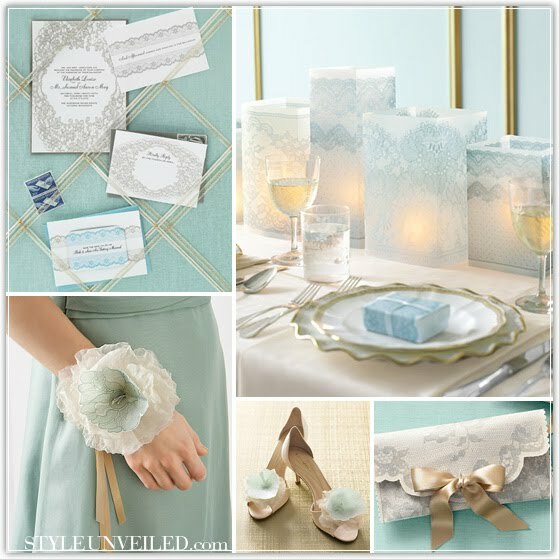 As such, vintage inspired weddings continues to be a trend in 2010. But don't worry - these re-imagined touches hit all the right style notes. From Style Unveiled, romantic lace gives new meaning to something old. your welcome kimberly! i saw them on your site and just had to share! This color palette is gorgeous -- so soft and elegant -- simply beautiful.